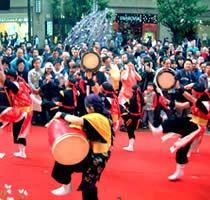 A new performance hall in Naha City is filled with activities and events as it commemorates its first anniversary. Tembus Hall, a creation of Naha City to attract both tourists and local citizens to appreciate the city and its culture, is the setting for a festival running through Monday. The five-day event began yesterday, and winds up Monday with a performance by Kubasaki High School cheerleaders, break dancing, Eisa and a juggling show. Today’s events are pretty much traditional Okinawan, with an arts and crafts exhibition running until 6pm at Tembus Hall on Kokusai Street in downtown Naha. The traditional arts and crafts exhibits will be open to the public each day 9am~6pm. Aside from the exhibits, discount sales on traditional Okinawa arts and crafts products will take place each day from 9am until 8pm. Okinawan entertainment begins at 1:30pm today inside the Tembus Hall, with a street performance starting at 5pm on Kokusai Street in front of Tembus Hall. 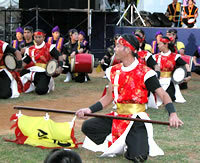 Look for a range of eisa and drum performances. Tomorrow’s a good day for foreigners, as Veteran’s Day affords a day off. 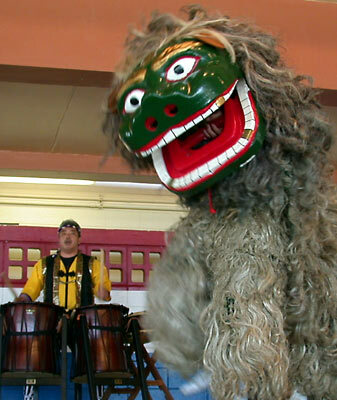 The entertainment starts in the hall at 1:30pm, with an outside eisa and drum performance at 5pm, followed by a break dance show and more eisa. Saturday promises more of the same, with entertainment inside at 1:30pm and a street shows from 5~8pm in front of Tembus Hall. There will also be an arts and crafts ‘experience’ through the day—9am to 5pm—with instruction on how to make bingata, pottery and Ryukyu glass. Also during the day there will be cosmetics, American candies and cookies, as well as health foods on sale. Midafternoon entertainment is billed as a super star performance at 3pm. Kubasaki High School’s cheerleades entertain at 5pm, and again at 8pm. The Tembus Hall celebration wraps on Sunday with a duplication of Saturday, just so nobody has to miss anything. Naha City officials say the event is a perfect example of promoting its city, Okinawa culture and traditions, and international friendship.